Sharps Chapel, TN, October 29, 2014--The Hyssongs, a gospel music group from Rockport, ME, have been named Top New Trio of 2014 by the Singing News. This fan award recognizes the rising popularity of this group which now has back-to-back top 20 radio singles. Their new release, “I Was Blind, But Now I See,” written by Rodney Griffin, songwriter of the year, is #7 on the Singing News Top 80 and #4 on the SGN Scoops radio charts. The Hyssongs, who began singing gospel music full-time in 2002, travel throughout the U. S. and Canada performing over 250 concerts per year. Another honor bestowed on the group was a main stage appearance at the National Quartet Convention in Pigeon Forge, TN. This past September they performed their hit song to an audience of approximately 12,000 people. Dell Hyssong, the baritone and founder of the group, when asked about their recent radio success said, “Our family is humbled that so many stations continue to play our music for the fans to enjoy. When we stepped out in faith to go into a full-time music ministry, we just wanted to make a difference and reach people for Jesus Christ.” Asked to comment on the award, tenor, Richard Hyssong said, “We were blown away when the presenters called our name. Follow The Hyssongs on social media outlets such as Facebook and Twitter. Franklin, TN (Mansion Entertainment) October 28th, 2014 - Mansion Entertainment has revamped and relaunched its Roku channel featuring Southern Gospel, Christian Country and Bluegrass Gospel music programming as MUSIC Mansion. MUSIC Mansion is now available on Roku devices featuring Gospel Music content, programs, artist interviews, comedy and special features. Roku viewers can locate the MUSIC Mansion channel in the 'Religion & Spirituality' category on Roku. The Roku streaming player is the market leader in streaming entertainment devices for the TV with over 10 million units sold. With over 1,000's of channels available on Roku, one of the faster growing channel categories is the Religion & Spirituality category. Roku devices are sold in most major retail outlets and are popular due to their simplicity and easy to use features. The focus of the MUSIC Mansion channel is to provide positive and inspiring music oriented content for its viewers. Viewers will find both current and classic music programming. For more information on the MUSIC Mansion channel and how to locate it on your Roku device, visit www.themansionentertainment.com. “This documentary is well worth watching. "...begs the question, 'Are we truly the hands and feet of Christ?' And if so, 'How well are we doing?'" TYLER, Texas – Oct. 23, 2014 – LITTLE HOPE WAS ARSON—which drew standing-room-only crowds at film festivals—unveiled its trailer and key art today. Distribution company, The Orchard, and production companies theCollaborate and Goodnight Smoke, will debut the film—part detective story, part faith film—November 21 in New York, and November 23, in the heart of East Texas where the story unfolded. Click here to download the key art. The film’s release will spread to Los Angeles, and a number of other cities including several in Texas, on November 28. LITTLE HOPE WAS ARSON tells the 2010 story of ten East Texas churches set ablaze in one month, sparking the largest manhunt in regional history. But once the crime was solved, the real mystery began. What drove two young men to do it? What effect did it have on their families and the churches? And when a church loses its building . . . can it still stand? Produced by Trenton Waterson of theCollaborate and Love of Goodnight Smoke, LITTLE HOPE WAS ARSON is executive produced by Bryan Storkel. PBS’ Independent Lens, with U.S. broadcast rights, will air the feature-length documentary during its 2014-15 season. Film and music distributor, The Orchard, acquired U.S. and Canadian rights other than broadcast and will release the film in theaters in multiple markets and through digital outlets. Love—the child of foreign missionaries—was particularly attracted to the story as he was raised worshipping overseas most often without the benefit of a church building. Returned to the states, he worked in building maintenance for a California mega-church. LITTLE HOPE WAS ARSON weaves thought-provoking questions throughout a gripping true-crime drama, in which communities are challenged, families brought to crisis and, ultimately, redemption sought. Pigeon Forge, TN (October 19, 2014) - SGN Scoops and Coastal Media Group are thrilled to announce that on Wednesday, November 5, 2014, Creekside Gospel Music Convention will host their artists` Red Back Hymn Book Choir! At 5:00pm on Wednesday afternoon, a choir of artists will fill the auditorium of the Smoky Mountain Convention Center in Pigeon Forge, Tennessee with the melodic sounds of favorite hymns. 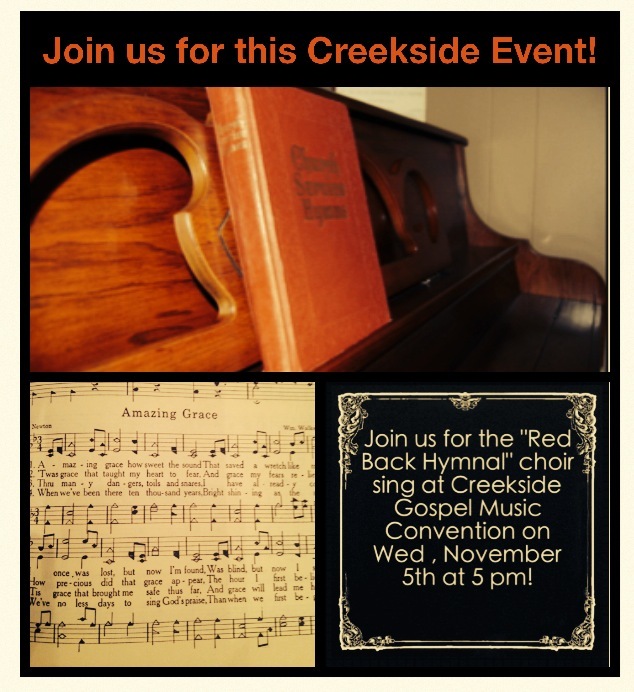 Creekside welcomes the combined voices of artists singing the old hymns and welcomes all those who appreciate the Red Back songs to the third night of the Convention. Pigeon Forge is an easy drive from many States and Creekside anticipates a full house on Wednesday night. OVERLAND PARK, Kan., Oct. 14, 2014 /Christian Newswire/ -- Some events are beyond human comprehension. Inspired by a true story, Robert Pascuzzi says a calling from God compelled him to search for answers after a close friend inexplicably murdered his wife and son, before taking his own life. The life-changing event led Pascuzzi to question his beliefs, but in the end, a chance encounter with a gifted person helped him and his wife discover a profound meaning. 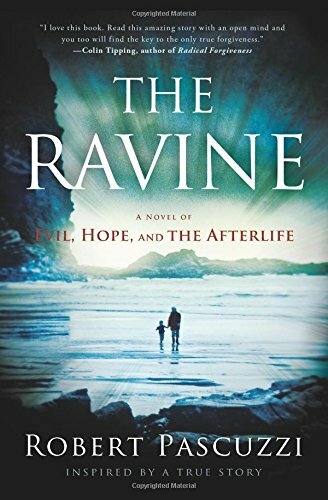 Motivated to share his journey and help others with similar challenges, Pascuzzi created THE RAVINE: a Novel of Evil, Hope and the Afterlife. Released nationally today through Midpoint Trade Books, THE RAVINE is available online and wherever books are sold in the greater Kansas City metropolitan region including Lawrence, Topeka and St. Joseph. "People desire a deeper understanding of how they shift from a place of tragedy to hope," Pascuzzi says. "THE RAVINE invites the reader to embark on a path of personal discovery, one that will challenge what you already think you know about forgiveness." "My wife and I were shattered. These were our best friends and suddenly they were gone. We had so many questions. As we sought answers, we learned more about how such terrible things like this can happen. We felt an obligation, through God's calling to finish this project. And, we learned something about ourselves and our beliefs. It is my hope this book can help others who are embarking on similar journeys." The book's message has been so well received that Pascuzzi has been asked to speak to a wide range of groups on the subject of faith, hope and redemption. He has not only spoken to church groups and civic clubs, but also to offenders at federal and state penitentiaries, where the message has resonated on a personal level. In conjunction with the book's release, he will be extending the speaking tour. "From the beginning, I felt compelled to share our experience about the book because the feedback from the pre-release was so strong," Pascuzzi said. Pascuzzi hopes people will have similar discussions through the book's website (TheRavineBook.com), Twitter (twitter.com/TheRavineBook) and Facebook (facebook.com/TheRavineBook). Those interested in arranging media events with Pascuzzi can contact him at theravinebook@gmail.com or Jeff Bollig atjbollig84@gmail.com. A native of Des Moines, Iowa, Robert Pascuzzi is a graduate of Briar Cliff University and moved to the Kansas City area in 1989. He is Vice President of Corporate Retirement Plans at Creative Planning, Inc. The company was recently ranked first by Barron's among the nation's Top 100 Independent Financial Advisors. McCray Dove and the Dove Brothers Band sadly announce the departure of bass vocalist David Cable. David has a great financial opportunity that will be better for him and his family that won’t allow him to travel with the Band’s schedule. David has been with the Dove Brothers Band for almost four years beginning as the bus driver for a year then the bass guitarist for a year and singing bass for almost two years. McCray states that “Poppa Dave has been a real joy to have in the band and is one of the finest bass singers you could have in a quartet! I hate to see him go! We will miss him and wish him and his family the best. I tell folks all the time that change is something that every artist/group faces in the music industry and you can either do two things. You can go with it or quit. This year I’m celebrating 27 years traveling and singing professionally. I've come too far to quit now!” McCray also states that there is no replacement at this time. The band will play on! NEW YORK, Oct. 16, 2014 /Christian Newswire/ -- The groundbreaking duo of Bluegrass & Country Gospel Music known as Diane and Mildred have released their chart climbing music on a 4-song EP; recorded with their GMA Band. Each of the four songs is a contemporary instant classic, much like the music performed on their telecast called Diane and Mildred's Gospel Music Arts which reaches into several Appalachian states. Fans of Bluegrass, Country Music, and especially fans of Gospel Music are quickly finding a rare treasure in this Traditional American Music lovingly created for inspiration and enjoyment! Their music is so compelling!!! Diane and Mildred's now-famous Bluegrass / Country Gospel duet sounds have graced both radio and television as well as countless stages. Their earnest devotion to the Gospel is evident in the heartfelt timbre of their singing, which strikes the listener's ears with an untrammeled beauty and warm, friendly tone. "What comes from the heart reaches the heart," agrees Mildred with Diane. Diane and Mildred's Bluegrass Gospel EP titled, Pickin' N Singin' Gospel Songs in the Country can be purchased from itunes, Spotify, CD Baby, or uploaded from their website www.GospelMusicArts.org. Explore their stellar-class, living website! Like them on FaceBook, purchase and share a few copies of their recordings today! Diane and Mildred's music is a cherished collectible treasure. ATLANTA, Oct. 16, 2014 /Christian Newswire/ -- CHRISTMAS IN HARVARD SQUARE, the debut major label and international recording from the Boys of St. Paul's Choir School, Harvard Square that was released last week, had an impressive opening week on the Billboard magazine charts, grabbing the No. 2 spot on the overall Classical Traditional Chart, the No. 6 spot on the overall Billboard Classical Chart and the No. 4 spot on the overall Seasonal Chart (all Christmas/holiday albums). It's an impressive debut for CHRISTMAS IN HARVARD SQUARE, especially considering it's a Christmas-themed album released in the fall, and that it topped albums from prominent artists such as Yo-Yo Ma, the Piano Guys, Michael Buble and Il Divo. "We are thrilled to see Christmas in Harvard Square already capturing outstanding feedback from early Christmas shoppers," said Monica Fitzgibbons, co-founder of AimHigher Recordings. "The combination of the rare next to the well-known repertoire seems to be drawing much enthusiasm from listeners. The fact that this goes towards benefiting St. Paul's Choir School is a joy and a privilege to be a part of." Founded in 1963 by Dr. Theodore Marier, an internationally acclaimed scholar of Gregorian chant, Saint Paul's Choir School is a musically intensive, academically rigorous Catholic day school that forms and educates boys in grades 4 through 8 in the rich music tradition of the Roman Catholic Church. The Choir School seeks to embrace the great cathedral school tradition as it unites a rigorous musical and academic curriculum with our Catholic faith and moral tradition, preparing each student to grow and flourish in a dynamic and changing world. Please contact Kevin Wandra (404-788-1276, or KWandra@CarmelCommunications.com) of Carmel Communications for all interview requests or Monica Fitzgibbons (monica@aimhigherrecordings.com) of AimHigher Entertainment for more information. The Share America Foundation, Inc. announced its first 2014 scholarship winner recently at the Ringgold Depot in Ringgold, Ga. The events help fund the organization’s Pearl and Floyd Franks Scholarship. Pearl and Floyd Franks are the late parents and former entertainment managers of actor/entertainer Randall Franks, "Officer Randy Goode" from TV's "In the Heat of the Night." Thescholarship honor students excelling in the Appalachian musical arts. 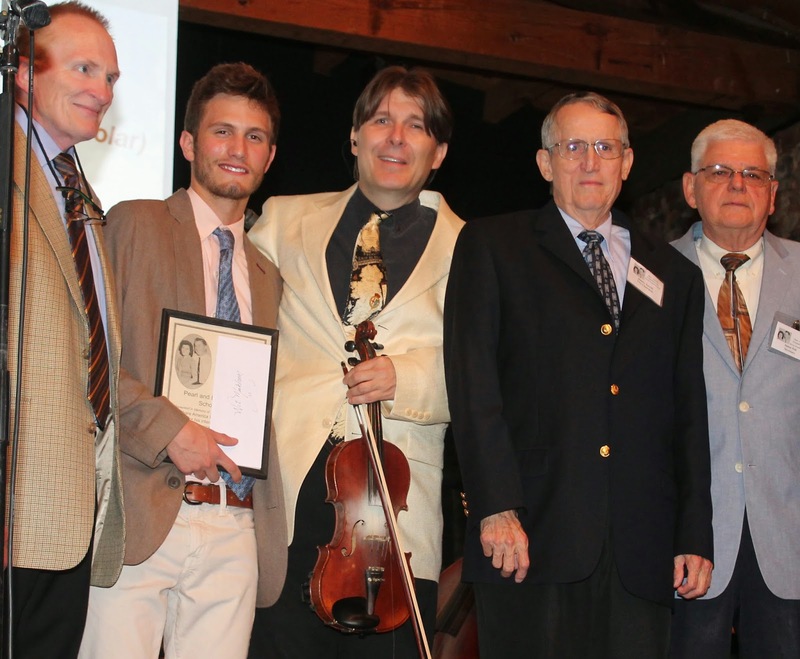 Fiddle player Wil Markham of Signal Mountain, Tenn. was selected as one of the 2014 winners. “Music has been a significant of my life since I was 7 years old,” he said. “Classical violin gave way to fiddling with Mountain Cove. High school brought an opportunity to join the marching band Drum Line and eventually Drum Co-captain. Markham is attending the University of Tennessee at Chattanooga. He wants to work in the music business industry and aspires to open a recording studio in Chattanooga. He performs regularly with Mountain Cove Bluegrass. “We were honored to present a $1,000 to assist him as he begins his college studies,” said Share America Chairman Gary Knowles. Markham is the son of Skip and Harriet Markham of Signal Mountain, Tenn. He is the grandson of Wilbourne and Delores Markham and Phil and the late Stuart Wilkerson. The group’s latest CD is “Mountain Cove III." Leader, Cody Harvey of Signal Mountain, started Mountain Cove Bluegrass during lunch hours at the new SMHS. The band is comprised with five members, Cody Harvey, Colin Mabry, Eli Beard, Tyler Martelli and Markham. “Wil is an exceptional musician and brings with him a great deal of enthusiasm in his craft,” Franks said. For more information visit www.mountaincovebluegrass.com or Facebook at Mountain Cove. Share America Foundation Board members include Franks, Knowles, Jimmy Terrell, vice chairman; James Pelt, secretary; and Jerry Robinson, Sr., vice president; and Adam Cathey. The next Sacred Sounds Fridays is Nov. 7, 2014 at 7:30 p.m. featuring the Hullender Family and Aimee’ Garner at the Ringgold Depot. Admission is a $5 donation. Franks will host the event. For more information about the organization and its programs, contact Share America, P.O. Box 42, Tunnel Hill, Ga. 30755 or visitwww.shareamericafoundation.org. 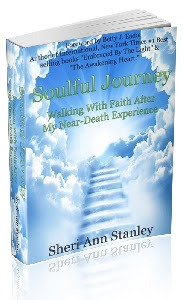 In her new release, "Soulful Journey: Walking With Faith After My Near Death Experience," Author Sheri Ann Stanley shares how her near death experience (NDE) led to a life transformation. If you've read or seen the movies Heaven is For Real, Gods Not Dead and Left Behind you will want to read Soulful Journey. PORTLAND, Maine, Oct. 17, 2014 /Christian Newswire/ -- Are you or someone you love reeling from the effects of a near death experience (NDE)? Are you struggling to make sense of what happened? Are you searching for the meaning behind it? In her debut book, Author Sheri Ann Stanley walks readers through her own near-death experience and how it shaped who she is today. In this amazing story, Stanley shares the harrowing moments of a near-fatal accident when she was only eight years old. She recalls in detail meeting Jesus in Heaven. A vibrant and beautiful journey of love and overwhelming euphoria. In the years to follow, Stanley battled debilitating, severe anxiety, frustration and exhaustion that threatened to consume her life. It was later compounded by grief following the loss of her beloved mother, Anne Marie Stanley. A woman who had always been a source of great encouragement and strength for Sheri. From here Sheri would find her way back to God. Her journey would involve self-help courses, researching religions, and journaling among other things. Listening to God and writing the words she heard helped her work through many life trials. It was from this place that she would begin to view her NDE with new eyes. In "Soulful Journey: Walking With Faith After My Near Death Experience," Stanley shares her testimony of faith in Jesus with the hope that those who read it will gain assurance that they can overcome any tragedy, illness, adversity, or heartaches as she did. "I am where I am today because I learned that God was my refuge. I was able to lean on God, cry to God, pray to God, and even shout at God. Finally, I surrendered to God. And, it was then that He carried me." -- Author Sheri Ann Stanley of "Soulful Journey"
Sheri Ann Stanley lives in the Portland Maine area with her Jack Russell Terrier, Haley. Soulful Journey: Walking With Faith After My Near Death Experience is currently available online at Amazon.com. For author interviews, speaking requests or for more information, please call 207-831-3456 or email s.a.stanley2013@gmail.com. Sheri Stanley writes from her heart, and will touch your heart with her Soulful Journey. The result of the trauma she survived as a little girl, her near-death experience has borne spiritual fruit at every crossroad of her life. Her perspective here is biblically-accurate, and she comes across as both humble and grateful for the strength she's gained through every trial -- all the result of how God has miraculously saved and transformed her. Thank you, Sheri, for sharing your powerful story! A must-read for those seeking peace, joy, wisdom. As an editor of two vastly different novels about near-death experiences, I have this to say: Soulful Journey is a poignant and personal account of one woman's journey from a childhood near-death experience, up through her search for peace, wisdom, and happiness, to her fulfilling spirituality today. Sheri bares her soul, her fears, hopes, and dreams in this novel in such a way as to inspire hope, faith, and joy in any individual... no matter where one may be in there life. Two thumbs up. RALEIGH, NC - Oct. 20, 2014 /Christian Newswire/ -- Faith Driven Consumer™, the group that emerged on the national stage last year with its #IStandWithPhil campaign that played a leading role in Phil Robertson's return to Duck Dynasty, has surpassed 10,000 signatures for its latest petition campaign, despite being initially blocked by Twitter. The petition--#HoustonWeHaveAProblem at HoustonProblem.com--asks that the City of Houston immediately "cease and desist all bullying and other offensive actions" against a group of pastors who are victims of aggressive harassment efforts at the hands of the city government. Last week, dozens of media outlets reported that the City of Houston had demanded that a group of pastors turn over any sermons--including personal correspondence such as emails--"dealing with homosexuality, gender identity or Annise Parker, the city's first openly lesbian mayor." "Thousands of concerned citizens are signing up in support of this important cause--harnessing the power of social media and keeping the pressure on Houston's governmental leaders. Faith Driven Consumers and people of conscience across the nation--including leaders at the local, state and national levels-are joining the call for the mayor and city officials to unequivocally reverse course and end their harassment of five respected area pastors and ultimately Christians throughout Houston," said Chris Stone, founder of Faith Driven Consumer. "We will continue to rally greater levels of grassroots support until tolerance and equality for people of faith are restored in the nation's fourth largest city." Faith Driven Consumer serves as an advocate for more than 41 million consumers-one in every six American adults-who spend $2 trillion annually. The#HoustonWeHaveAProblem petition campaign reminds everyone that "pastors have been at the very center of American society since even before our founding as a nation, and they remain an integral part of the lives of untold of millions of Americans today," that "our First Amendment protects freedom of speech and religion" and that "we...live in a society that values equality, including the notion that everyone has the right to publicly express deeply held beliefs without fear of persecution or reprisal." Signers at HoustonProblem.com express the desire that "the City of Houston, in its quest to provide protection for LGBT citizens, to equally and explicitly acknowledge and ensure the equal rights of people of faith to live and express openly their deeply held religious beliefs." Read the full petition at HoustonProblem.com. Faith Driven Consumer™ leads a movement of more than 41 million Americans, 17% of the adult population, who spend $2 trillion dollars annually. The group educates, equips and motivates Faith Driven Consumers to action in the marketplace of goods, services and ideas--offering resources for making more faith-conscious decisions, including reviews of companies and entertainment products. Recognized for its #IStandWithPhil, #OpenZilla, #FlipThisDecision, #IStandwithHobbyLobby and #NoahMovie campaigns, the organization continues to serve as an advocate for people whose faith informs their daily decisions in the marketplace. For more information go to: www.faithdrivenconsumer.com. Pigeon Forge, TN (October 20, 2014) – The 2014 Creekside Gospel Music Convention is just a few weeks away and Coastal Media Group has been working hard to present another great week of Gospel music. On November 3rd through 6th, artists and fans from across the country will head to the Smoky Mountain Convention Center in Pigeon Forge, Tennessee for evening concerts, daily matinee presentations and much more. Little Willie Wynn along with Woody Wright and all their friends will appear for a “Bash” on Monday night. Tuesday night, SGN Scoops will host their 2014 Diamond Awards ceremony, highlighting the best in Southern, Country and Bluegrass Gospel. Wednesday night, special features include the popular Red Back Hymnal Artist Choir at 5:00pm and the special CD release party for The Kramers at 8:00pm. Thursday night, Creekside will host their closing ceremonies. Each day of the event there will be Chapel Services as well as Concert Matinees. Creekside will welcome artists such as The Freemans, The Steeles, The Williamsons and many more. Best of all, the tickets are free for each event. The Creekside Gospel Music Convention will be presented on November 3rd through 6th at the Smoky Mountain Convention Center, Pigeon Forge, Tennessee. Tickets for this event are free but must be reserved at http://www.creeksidegospelmusicconvention.com/ . Special room rates are available onsite and can be reserved by phone at: 1-800-223-6707 or local call 865-908-3015. 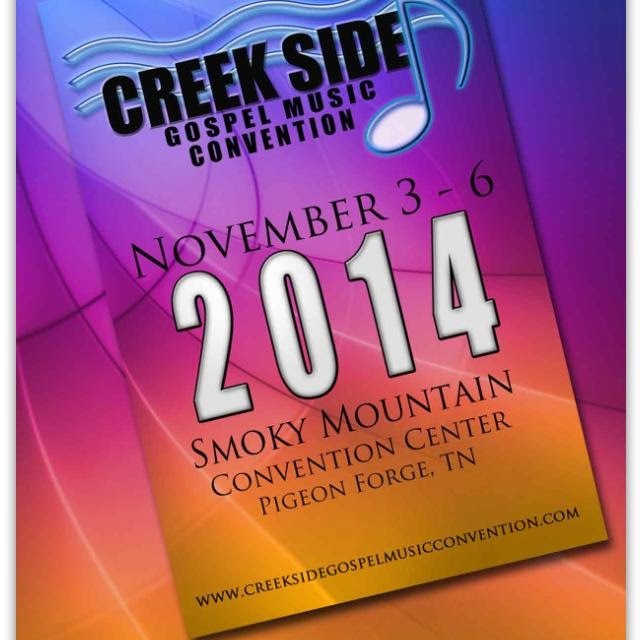 For more information regarding the 2014 Creekside Gospel Music Convention, please email Rob Patz at rob@sgnscoops.com . Pigeon Forge, TN (October 13, 2014) HIGHROADIII had the privilege of singing at Dollywood September 30 and October 1st. The group performed at the Back Porch Theater and had a full house for almost all of the 8 shows. The group played all of the songs on their current project which was produced by Ben Isaacs as well as some ragtime and fiddle tunes. Their enthusiasm for the music they perform is always contagious to the audience they are playing and singing to. HIGHROADIII played back-to-back concerts both days lasting 30 minutes each at 1:30, 2:30, 3:30 and 4:30, captivating the audience with each performance. The energy filled execution of each song kept those in attendance glued to their seats. The country/bluegrass feel of their music seemed like a natural fit for Dollywood. Lead singer and keyboardist Sarah Davison commented "We enjoyed playing at Dollywood so much and look forward to the opportunity to play there again soon. We met some wonderful folks from all over the world and it was so encouraging to see their reactions to our music, especially our original songs. We want to thank everyone on staff for their hard work to keep Gospel music thriving at Dollywood." You can learn more about HIGHROADIII by going to http://www.highroadmusic.com or https://www.facebook.com/HIGHROAD3 . You can reach them by Twitter athttps://twitter.com/highroadmusic . For booking contact highroadmusic@gmail.com . Nashville, TN – A good time was had by all as gospel music fans enjoyed the second annual Loretta Lynn Gospel Festival recently. The weekend of September 13-14, 2014 was filled with great gospel music and fellowship as the country legend welcomed people from all part of the United States to her ranch for a most enjoyable weekend. Organizers have already announced dates for the third annual festival - September 12-13, 2015 - and it will once again be held at the Loretta Lynn Ranch. "We had a wonderful time this year," said Jeff Sneed, producer and promoter of the weekend. "It was so great to see the smiling faces singing along to their favorite songs and meeting their favorite artists. I am so thankful to this wonderful woman, Loretta Lynn, for beginning this festival! Everyone has a great time." Patsy Lynn, event organizer, comments: "My mother loves gospel music and it thrills her heart to hear the music ring through the hills of the ranch. Thank you to Jeff Sneed and all those involved behind the scenes for making the event run so smoothly! We can't wait for 2015! If you missed this year, make your plans now!" Loretta Lynn’s Ranch in Hurricane Mills, TN is the perfect destination for this amazing weekend of Gospel music. The full service RV park features primitive camping, pools, canoeing, paddle boats and more. Guests can also tour Loretta’s plantation home, the Butcher Holler Home Place, and her brand-new 18,000 square foot “Coal Miner’s Daughter” museum. An on sale date for tickets to the 2015 festival will be announced soon. Visit LorettaLynn.com to stay updated. Grammy Winner Jason Crabb performs during the 2014 Loretta Lynn Gospel Festival. The Hoppers perform during the 2014 Loretta Lynn Gospel Festival. The Sneed Family welcomed legendary Naomi Sego to the stage for a surprise appearance. The Freemans join with Buck Rambo and Rambo McGuire for a special moment. Aaron Wilburn kept the event moving all weekend with funny stories and great songs! The Booth Brothers perform during the 2014 Loretta Lynn Gospel Festival. Karen Peck & New River perform during the 2014 Loretta Lynn Gospel Festival. Brian Free & Assurance perform during the 2014 Loretta Lynn Gospel Festival. Pictured at an IBMA Awards after-party are Mickey Gamble (left), president ofCrossroads/Mountain Home Music Company of Arden NC, and Tim Surrett of the multi-award winning band Balsam Range. Surrett is the original founder of the Mountain Home label. Balsam Range was named both Vocal Group and Entertainer of the Year with singer/fiddler Buddy Melton named Male Vocalist of the Year and Tim Surretthonored with the Mentor Award. Adam Steffey of The Boxcars won the Mandolin Player award. With its second album released earlier this year, the vibrant young group, Flatt Lonesome was named Emerging Artist of the Year. All in all, a very good day for the ambitious record label based in North Carolina’s unassuming community of Arden. So, aside from the recognition and a moment in the spotlight, what can awards mean to an artist’s career or to a record label? What is the effect on the business of the music business? Mountain Home Music Company counts among its artists multiple nominees and winners in the Grammys, Dove, IBMA, SPBGMA, ICM (Inspirational Country Music) Awards and more. President, Mickey Gamble, shares his thoughts. “The result is multi-tiered. Awards can have a positive effect on the way everyone connected with the winner conducts business: artists, songwriters, publishers, labels and agents. A high profile nomination or award, especially something that is widely covered by the media, can boost sales and increase tour dates for the artist,” Gamble says. “There is a level of credibility that comes with having award winners on the label that enhances the overall reputation of the label, making it easier to attract other promising or very accomplished artists to the roster, and that means we get to do more of what we love most: working with talented artists and supporting their creation of great music,” Gamble notes. Many great bands are competing for a finite number of quality tour dates. Award recognition can pave the way to the stage of venues that might have previously been a tough sell. From the agent’s perspective, Mike Drudge of Class Act Entertainment, (pictured, Drudge books acts including Balsam Range and The Boxcars), adds his thoughts of the effect of awards on the business of music. Mountain Home Music Company, a division of Crossroads Entertainment and Marketing, Inc., has earned a reputation as a premiere Bluegrass label with global distribution. The label boasts elite artists including Doyle Lawson & Quicksilver, The Boxcars, Lonesome River Band, Balsam Range, The Grascals, Snyder Family, Darin & Brooke Aldridge, Danny Roberts, Crowe Lawson Williams, Flatt Lonesome and in a new signing at IBMA’s World of Bluegrass, Chris Jones and The Night Drivers. Established in 1993, Crossroads is a market leader in the Bluegrass, Americana, and Christian Music fields.